3.9 SQ Podcast Episode 8 – What’s that word? 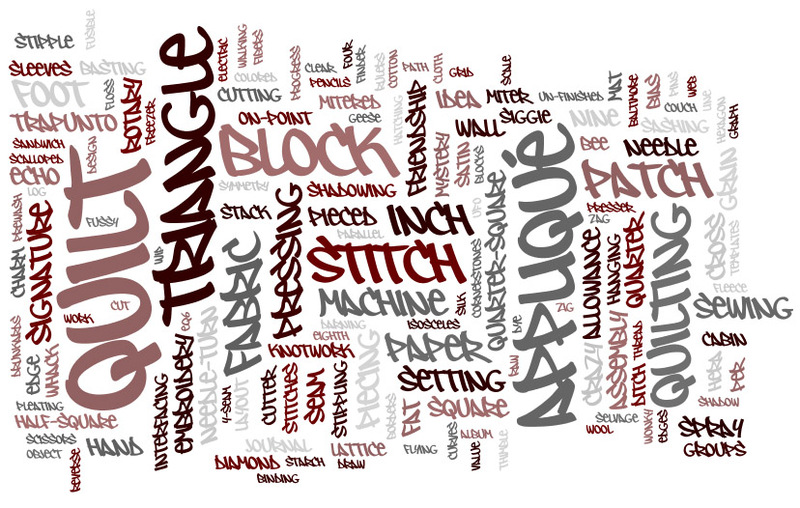 Although slightly unusual for a science/math/quilting blog and podcast, I want to focus on vocabulary. In math you have all the integral signs and the large sigma and the n-notation everywhere. In physics, essentially you learn the greek alphabet, math, equations everywhere! 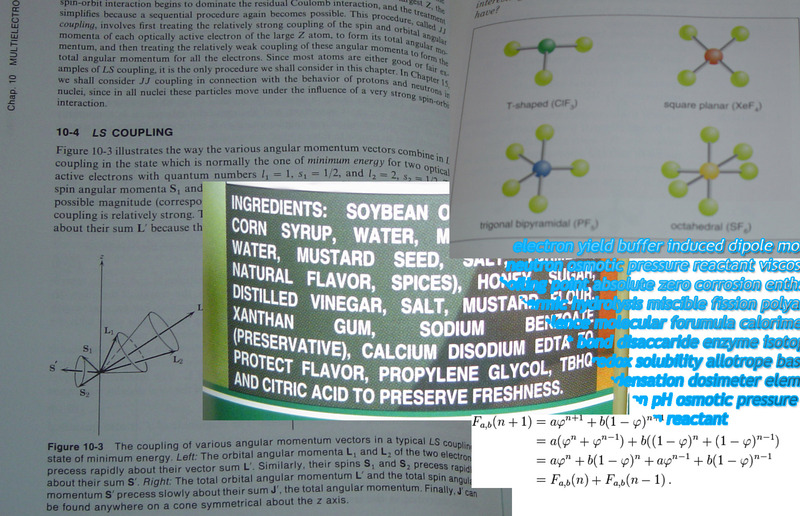 Chemistry is no better, with all the organic chemistry notation. For example one diastereomer is trans-3-methylcyclopentanol (I have no idea what that is used for, but it looks complicated, right?) The other enantiomer is cis-3-methlycyclopentanol in case you’re wondering. With terms like this, its easy to stop in your tracks and run the other way. Sure. Go ahead. See ya next podcast and post if you follow suit. But for a vocabulary adventure, keep reading. But you don’t encounter intimidating vocabulary only in the science classroom. Or in any classroom. There are things all around us that cause us to feel intimidated just by saying them out loud. After doing a little bit of research, I found out that “eschew obfuscation” means “avoid confusion“. Sometimes intimidating vocabulary can be used (like I did with the science words) to intimidate you. Or as Timelady says: “sometimes (people) genuinely do not realise that it is unreasonable to expect others to understand such words – perhaps they are (using) technical jargon, abbreviations, acronyms”. Do I feel that a lot of people in my life do this on a regular basis? – NO. Do I feel that quilters have such a crazy complicated vocabulary such that they cannot express their meaning to me in a way I can’t understand? – Also NO. If someone does intimidate you verbally, Timelady says to counter with something to the effect of: “oh I don’t know what that word means. Could you tell me? Thanks for increasing my language skills”. With hobbies of any kind, science fiction, fishing, quilting … etc. there is usually a learning curve to understanding the hobby. Learning product and equipment names can seem confusing to use. Materials used in creating a project have their own names, brands, and acronyms. Other times it is a specific technique that is being demonstrated, and a skill that has to be learned. Sometimes abstract concepts are best described with a certain word or phrase like “color value”, gradation, contrast. Some of these techniques are simple in idea, but also complicated such that it takes a lifetime to master. Space saving when communicating is facilitating our use of acronyms and symbols. Text messaging, tweeting, and constant communication is shortening our words and ideas to “WIPS” “UFO’s” “HSY” (haven’t started yet – heard by me first on Annie Smith’s Quilting Stash). Referring to loved ones as DH, DD, MIL, …. is necessary sometimes to protect privacy. The reason I haven’t pursued crochet and knitting is the pattern and symbol notations used in patterns as space savers. I see the pattern notation, don’t take time to analyze it, and put the project down, never to start on it. I COULD figure it out if I had the desire to learn, but for now I’ll just do quilting with its visual blocks. Dictionaries, lots of dictionaries. Ruthann has dictionaries everywhere. Christine has dictionaries at work and at home. I use www.m-w.com or www.dictionary.com or www.wikipedia.com to learn about things I don’t understand. iPhones (with access to dictionary.com) and Kindles have places to look up vocabulary too, so you don’t have to carry around a large dictionary everywhere you go. 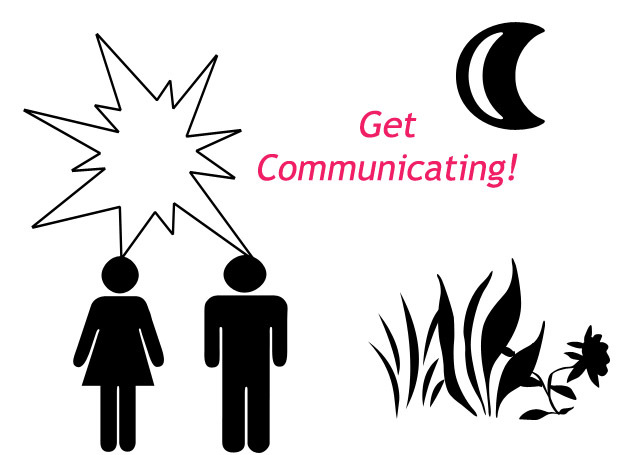 Listen to Podcasts, listening to complicated words spoken several times gets you familiar to the words and ideas. This makes it easier when you actually do the technique or use the product. 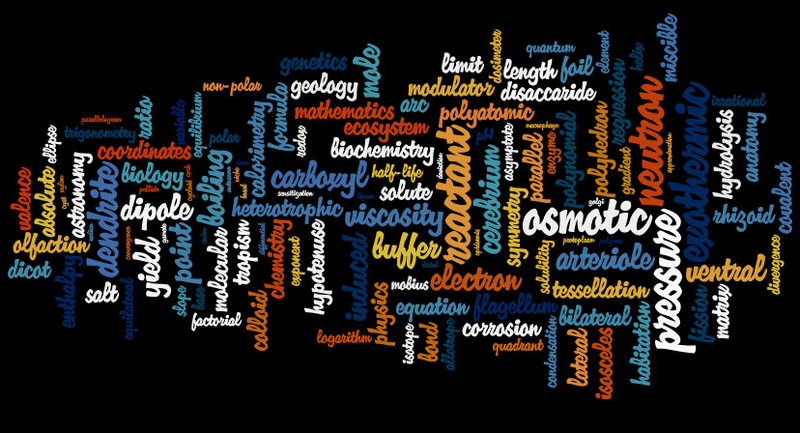 Use word clouds to gain familiarity. Create your own on Wordle or Tagul. Google search – or your favorite web search engine. Post on a forum about what other people know. People are generally helpful enough to answer your questions. Matching quiz. Write or copy the list of words and the list of definitions and paste each into two separate columns in a word processing or spreadsheet program. Then alphabetize all the words alphabetically, and alphabetize all the definitions reverse alphabetically. Do a matching game. Create flashcards. Used this to demonstrate the idea of stoichiometry in equations. Physically moving something around helped with movement and learning. As quilters, we move around the parts of our quilt blocks – that is similar to how to learn balancing equations. Create a blog about a new word or idea. Chances are that teaching someone else something will help you learn it better yourself. Blogs are good for this. I hope you enjoy a little crossword that I created using words from Quilt University’s own Quilt Glossary. You can find the PDF below. Here’s my First Completed Quilt! This quilt was done from Carol Doak’s Your First Quilt Book, ribbons pattern. Most color and quilting decisions made by Carol Doak. I need to read more carefully Jennifer Ruvalcaba’s episode notes next time for the binding, or not worry about the sleeve so much. What do you think about dihydrogen monoxide (DHMO)? I just wanted to let you know that I’d hear about RSS feeds and kinda knew what they were about but now, because I listened to your podcast this afternoon, I’m going to subscribe to a reader and set up some blogs to follow. So, “No”, not everyone knew what they were or how to use them. Keep up the good work Darla! I learned a few things from that too! Now everytime I find a new blog I open up reader, hit the subscribe button, copy and paste the address in. Quick and easy and organized. Now I have to start with the stars and the likes and other things. Hey, Darla, same jill as Big Tent–thanks for the hello. Your quilt is lovely, really nice job of color selection. It will be a great window hanging and then you will always be able to see it and admire. Good podcast subject. You sound as if you are getting more comfortable w/the microphone. I think one of the things I enjoy most about listening to podcasts is that it is just like listening to a “friend” talk about whatever is interesting to her at that moment. We get to learn something in a very fun way. keep up the corny jokes; they make us laugh. Hey Jill nice to see you here too! Thanks for the compliment on the quilt. Most of the selection was Carol (Doak’s), but not all, so that’s good. Thanks for your comment on the subject too. I never can tell what others are going to want when I go “astray” a little bit, but variety is the spice of life! I don’t know what I was laughing about most of the first part of the podcast exactly, other than myself. Which I am glad to be able to have corny jokes that others can at least giggle at as well. For more inspiration for that silly side I can hide so well, I need to listen to more patchwork and pacifiers. It’s pretty cool to see all these friends emerge out of nowhere (a year ago I knew NONE of this existed), so keep in touch!